The Great American Baking Show will be back just in time for the holidays. This week, ABC announced the TV show’s third season will debut in December. 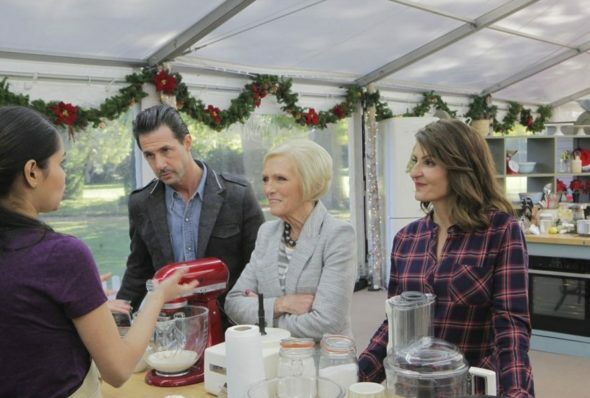 The cooking competition series pits amateur bakers against each other “as they compete in holiday-themed challenges and eliminations all hoping to be named ‘America’s Best Amateur Baker. '” The new season will feature Paul Hollywood and Johnny Iuzzini as judges as well as new hosts Ayesha Curry and Anthony ‘Spice’ Adams. Season three of The Great American Baking Show premieres on ABC on December 7th at 9 p.m. ET/PT. Television personality and author of six best-selling cookbooks, Paul Hollywood, (“The Great British Bake Off”) joins James Beard Award-winning pastry chef and cookbook author, Johnny Iuzzini, as judges where each week they will taste decadent and delicious treats alongside show hosts Ayesha Curry, New York Times best-selling cookbook author and television personality, and Anthony “Spice” Adams, former NFL star and media personality. What do you think? Have you seen The Great American Baking Show? Will you watch the new season? More about: ABC TV shows: canceled or renewed?, The Great American Baking Show, The Great American Baking Show: canceled or renewed? The Great American Baking Show: Is the ABC TV Series Cancelled or Renewed for Season Five? The Great American Baking Show on ABC: Cancelled or Renewed for Season Four? The Great American Baking Show: Cancelled by ABC? Should the TV Series Return? I really enjoy this show. I have been waiting for another Christmas show. Can’t wait. I have purchased seasons 1,2,3 and 4 of the Great British Baking Off and would love to buy more seasons. I would also like to buy the 2015 Christmas Baking show. Please let me know where I can purchase them. Thank you for putting good t.v. Back on the air. I a m really glad to see this return! However I really did enjoy Nia Vardolos and her husband as hosts. I wish it was longer than 3 weeks. Not much of a competition, but I am going to watch!